Since there are no natural springs at Masada, and since the area only receives 2 in. [50 mm.] of rainfall each year, it was necessary to bring water to the site. 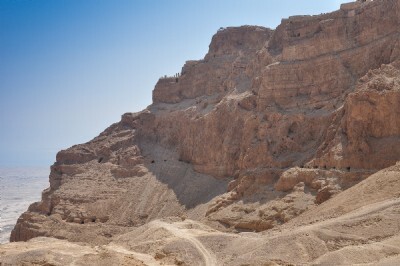 Herod solved this problem by building numerous cisterns on the summit and northwestern slope of the site. During the winter, the rainwater that collected in the bottom of the valleys west of Masada were diverted into two aqueduct systems that delivered the water to two rows of cisterns located on the northwestern slope of Masada. From these cisterns convoys of animals followed two paths that led up to the top of the mountain. There, water was store in cisterns on the top of the mountain that could be used during peaceful as well as war times. The water was used for drinking, hygiene, and recreational (swimming pools and baths) purposes.